Life with Lily by Mary Ann Kinsinger and Suzanne Woods Fisher. Book One in The Adventures of Lily Lapp. Review: For Lily, everyday is a new adventure! 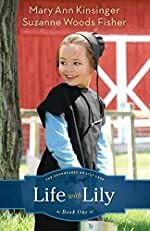 In the Life with Lily, by Mary Ann Kinsinger and Suzanne Woods Fisher, five year old Lily Lapp is growing up in an Amish community in rural New York, and she's learning a lot of new thing about the world. In this book, Lily explores the world through the eyes of a young Amish girl who living a life full of surprises, both good and bad. Journey with Lily Lapp through the new experiences you will see in this book, the first in a series. Lily Lapp is a young girl living on a small Amish farm in upstate New York. Her life is much, much, different from ours, as you will see in this book. But this is the only life Lily has ever known; the simplistic life of any other four year old girl. Lily and her family, her mother, father, and brother, Joseph, own a farm in an Amish village, surrounded by friends and family they have known they're whole lives. But change is inevitable; Lily will have to adapt to a new life as they welcome a new baby brother into their home, a new teacher at school, and many more things. Lily Lapp is starting school with her this year, along with her cousins Hannah and Levi. So is Mandy Mast, the mean girl who always seems to get Lily to do something that gets her into trouble. Lily must learn to live in a diverse world where not everything is as simple as it should be. In Life with Lily, Lily learns that change comes to everyone; she is definitely experiencing it herself. What will happen when Lily must move away from her small farm in upstate New York? Lily's life will never be the same, and with every day she's learning something new! The book Life with Lily is, in my opinion, a decent book, even if a bit boring. Personally I did not find it suspenseful or engaging, though the detail and imagery was wonderful. I could really feel what Lily was feeling, and take in her surroundings as if I was standing there watching the scene. The plot is hard to identify, as this is the type of book that has many little problems or conflict along the way rater than a main conflict. The characters were not developed as well as I would have liked, but that was probably the best that could happen due to the main character being a five year old. I suppose you would say this story has "flat characters", because we do not find out much about Lily's personality. Also, I found no suspense or hook to this book whatsoever. I have to admit that it took me over a month to read just because the story struck me as dull and unexciting. The plot did not capture my attention at all, personally. The story does have a very relatable moral, though; change is inevitable. In this book, Lily is facing many changes that are not unlike what everyone else in the world faces. It was interesting to watch as she coped with these changes as she grew through the book. The book does provide fascinating insight about the Amish way of life, and I learned a lot of new things by reading it. I would recommend this book for younger readers, grades 3-5, who aren't looking for a lot of action, but rather looking to learn new things and explore different ways of life. All in all, Life with Lily is a fairly dull book with some good aspects such as the presence of a good moral and creative imagery. Review written by Amina (6th grade student). We would like to thank Revell for providing a copy of Life with Lily for this review. Have you read Life with Lily? How would you rate it?